The San Bernardino County Board of Supervisors have joined together to promote Give BIG San Bernardino County, a historic online giving campaign. 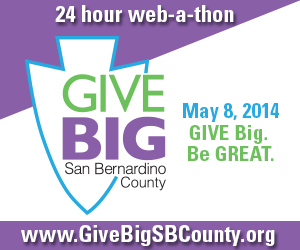 Give BIG San Bernardino County is a 24-hour online web-a-thon beginning at 7 a.m. on May 8, 2014 and ending at 7 a.m. on May 9, 2014 with a goal of raising $300,000 for local nonprofits and inspiring donors to become lifetime philanthropists. As they prepare for the campaign, charities and nonprofits throughout the county are learning new skills in marketing and how to use social media to enhance their fundraising efforts. Fourth District Supervisor Gary Ovitt is promoting Give BIG on Twitter @SupervisorOvitt. First District Supervisor Robert Lovingood spoke to nonprofit leaders on Friday and promoted the campaign in his newsletter. Board Chair Janice Rutherford has been promoting Give BIG on Facebook, in her electronic newsletter, and at her speaking engagements in the county. She also made Give BIG the theme of a breakfast event she held in Crestline in April. Donors don’t have to wait until May 8 to log on at www.givebigsbcounty.org and schedule a contribution. Donors can choose from more than 250 San Bernardino County nonprofits representing children, families, veterans, seniors and animals, just to name a few. Watch this video of the Give BIG San Bernardino County launch event to learn more about this campaign.